The Si24DTsens-12B digital temperature assembly is used as a plug-in accessory with all Signal Consulting, LLC Controller Boards when high resolution (+/- 0.06250 C) temperature measurements are required. This assembly uses a small,12-bit Digital Thermometer (sensor) manufactured by Dallas Semiconductors with part-number of: DS18B20, www.dalsemi.com. It can measure temperature from -550 C to +125 0 C with 0.06250 C resolution and with +/- ½ 0 C accuracy. Because this sensor is digital in nature, it is virtually immune to noise or loading and it is ideally suited for remote sensing applications. This sensor is factory calibrated by Dallas Semi and has excellent log-time stability. In addition, this sensor has a small thermal-mass and a small OD. The Si24DTsen-12B assembly includes the DS18B20 sensor, Teflon-coded #24 gage, 12” long, connecting wires (to minimize thermal-conduction) and a small 3-Pin Molex 22-01-3037 Polarized FN Connector for quick connectivity. 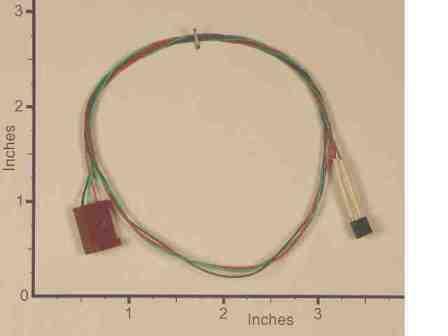 This sensor uses a unique “1-wire interface” that can operate in parasite power mode. In this mode, it requires only 2-conductors for reliable remote (long as 20 meters) temperature sensing. See diagram below for parasite power mode in remote sensing application. Si24DTsens-12B , Dallas Semiconductor DS18B20 in TO-92 casings, 12-Bit, High-Precision, 1-Wire Digital Thermometer with 12" leads and 3-Pin Molex 22-01-3037 Connector.